We all want access to Star Wars: The Old Republic's beta, but BioWare warns that the internet is rife with frauds ands scams. 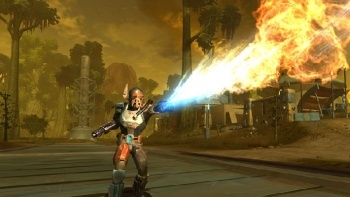 Writing on The Old Republic's forum, community coordinator Allison Berryman reveals that BioWare has encountered several instances of people who "sell testing accounts, 'beta keys,' or other offers of access to our Game Testing Program." What with 1.5 million people trying to get access to the beta, the existence of such offers is unsurprising. However, "All of these offers are false. BioWare is not issuing invites to Game Testing via any method other than those we outline here on SWTOR.com." But the scams don't end there. Fake e-mail invites to the program, masquerading as official BioWare invites, have been found, and will often lead to an official-looking site hoping to trick you out of your credit information. BioWare stresses that any real invite will come from [email protected]. "Any other e-mail address claiming to offer an invitation is likely to be a scam." BioWare warns that anyone trying to sell you access to the beta is a scammer, trying to part you from your "money, credit card information, or identity." It also says that no matter how excited you may be for Star Wars: The Old Republic, your security is more important. And for those of you entertaining the thought of buying or selling a real beta account, "The sale of accounts with access to the Game Testing Program is strictly prohibited by the Game Testing Agreement," and any accounts that are found to have been traded or sold are immediately banned. What is this world coming to when you can't even trust a beta invite?